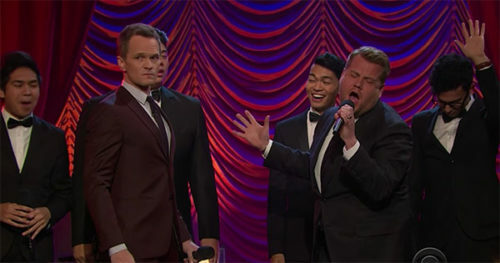 Before joining Late Late Show host James Corden on his couch, television, film and Broadway star Neil Patrick Harris appeared on the stage to challenge the car karaoke crooner in a riff-off of Broadway show tunes. And the results were legend… (wait for it) …dary. The Tony-winning Harris mocked his host for winning that award for his spoken-word performance in the play “One Man, Two Guvnors.” The boys were backed-up by Filharmonic, and sang their hearts out — so much so, that Harris later revealed he split his pants. From “Guys and Dolls” to “Hamilton,” the two singers duked it out, with Harris showing his amazing range and Corden giving quite a performance of his own.